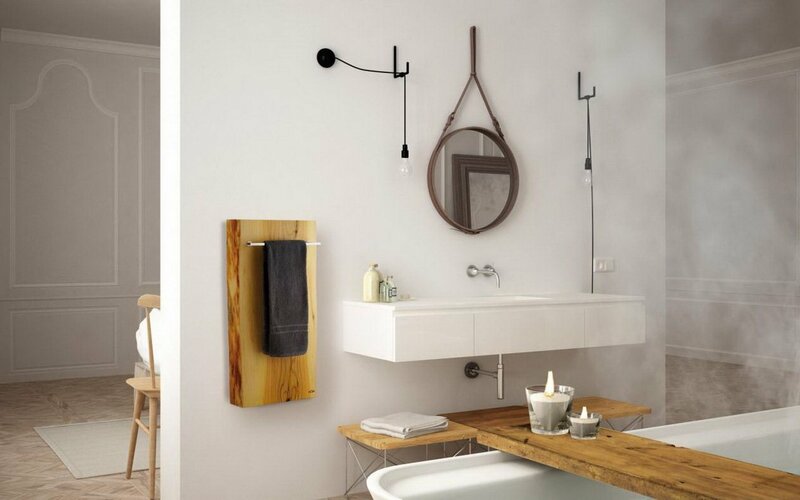 The Sophia towel warmer is made by marrying the most advanced composite heating technology with a simple slab of Lebanese cedar with peeled edges. When it warms up Sophia spreads not only warmth, but gives off a pleasant scent of resin typical of the Lebanese cedar - something truly unique that makes our towel warmer to stand out of the crowd. The Sophia electric towel warmer is a great furnishing complement for our Sophia bathtub and furniture suite. Our products have been designed to transfer the maximum amount of heat to surrounding material in the shortest possible time. 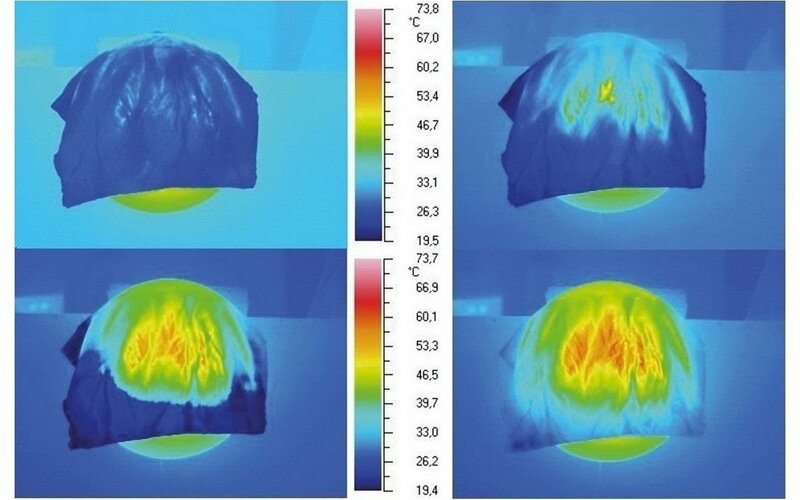 In the images above, the sequence detected with infrared thermography of the drying and subsequent heating of a wet cloth resting on our towel warmer. 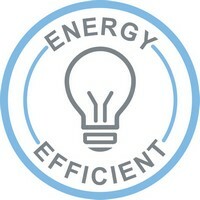 Our innovative towel warmers and radiators are designed upon innovative sintered tile incorporating a native electric resistance; a proprietary technology born after many years of research in collaboration with the Politecnico di Torino, which represents the most advanced technology in the field of electric heating. Our radiators and towel warmers incorporate Class 2 insulation (intrinsically safe devices featuring a double electrical insulation), feature dielectric isolation greater than 3000 V and water absorption of <0.1% after 24 hours of immersion. With the energy of a 100 W bulb, our towel warmer can heat your clothes and warm them up in just a few short minutes. 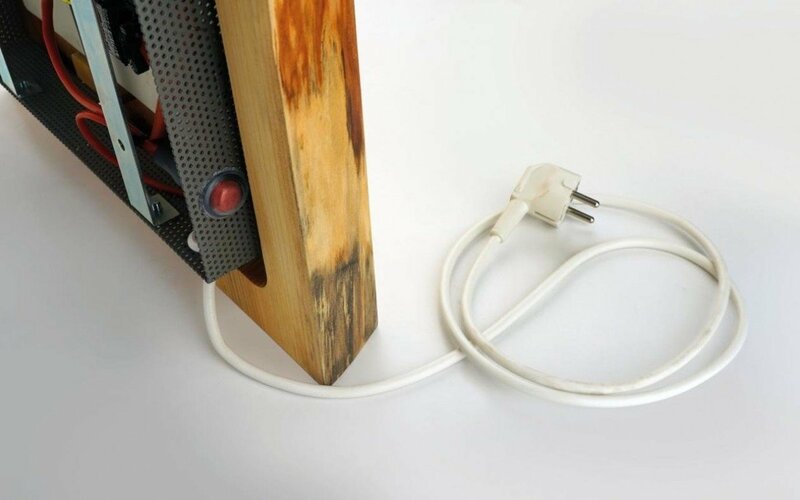 The thermal inertia of the heating element along with proprietary assembly techniques allow our radiators and tower warmers to continue transferring heat even after switching off power for more than 15-20 minutes.